"The USD is stuck at the bottom of the so-called ‘dollar smile’, which links its path to the performance of the US and global economy as well as the risk sentiment of investors." 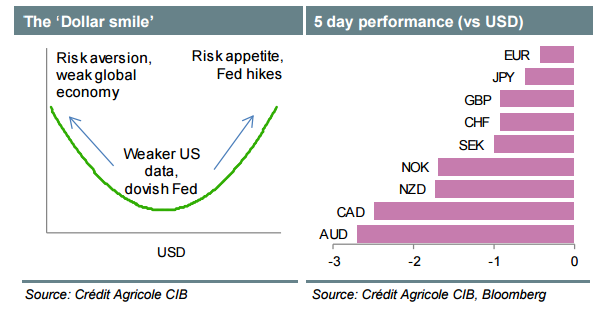 "We therefore expect USD to appreciate again against G10 commodity currencies as investors start questioning the Fed's ability to fall further behind the curve and the sustainability of the commodity-price rally in the presence of persistent downside risks to the global recovery. EUR and JPY should also remain more resilient against this background." "Among the key events next week will be the BoE’s May inflation report. Investors will want to know whether the MPC sees the latest economic slowdown as temporary, driven by Brexit fears, or persistent and thus likely to affect the policy outlook. With the EU referendum approaching, the MPC should stress the asymmetric risks to the outlook. This coupled with more evidence that the support for Brexit remains unabated should keep GBP on the defensive across the board." 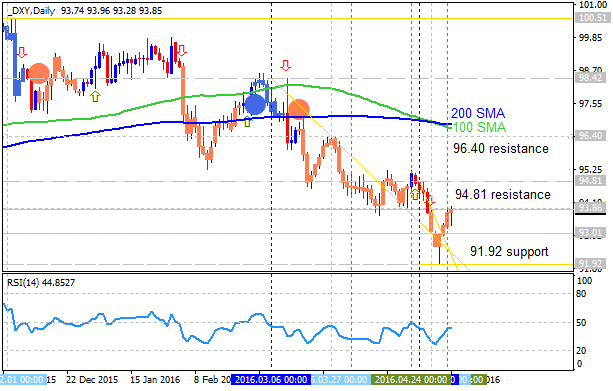 Daily price is located below SMA with period 100 (100 SMA) and SMA with the period 200 (200 SMA) for the bearish market condition: the price is ranging within 91.92 support level and 94.81 resistance level with RSI indicator estimating the ranging bearish trend to be continuing in the near future. Bullish reversal resistance level is 96.40, and if the price breaks this level to above so the reversal of the price movement to the primary bullish market condition will be started. If the price will break 94.81 resistance level so we may see the local uptrend as the bear market rally. If price will break 91.92 support so the bearish trend will be continuing. Last edited by 1Finance; 05-07-2016 at 07:33 AM. Graeme Wheeler’s speech, US Crude Oil Inventories, rate decision, Mark Carney’s speech, US Unemployment Claims, Retail sales, Producer Prices and consumer sentiment. These are the main events on Forex calendar. Graeme Wheeler speaks: Tuesday, 22:05. RBNZ Governor Graeme Wheeler will speak in Wellington. US Crude Oil Inventories: Wednesday, 15:30. U.S. crude inventories climbed to fresh record highs last week rising by 2.8 million barrels. The reading was considerably higher than the 0.6 million barrels forecasted by analysts. The increase pushed oil markets lower. Brent crude declined more than 5 since Friday’s high due to rising output from the Organization of the Petroleum Exporting Countries, signs of economic slowdown in the United States and Asia, and a stronger dollar. Some investors believe this trend will continue in 2016 while others expect improvement. UK Rate decision: Thursday, 12:00. The Bank of England decided to keep rates unchanged at its April meeting aiming to reach the 2% inflation target and maintain growth and employment. The MPC members forecast the Bank rate will rise to ensure inflation returns to the target in a sustainable fashion. Mark Carney speaks: Thursday, 12:45. The Bank of England governor Mark Carney will speak in London about the Inflation. US Unemployment Claims: Thursday, 13:30. The number of Americans filing initial claims for unemployment benefits increased more than expected last week, as claims registered the biggest gain in more than a year. Furthermore, the energy sectors increased the number of layoffs due to low oil prices. The number of claims has increased by 17,000 to a seasonally adjusted 274,000. Analysts believe the rise is technical. The four-week moving average of claims increased 2,000 to 258,000 last week. The number of claims is expected to reach 277,000 this week. German GDP data: Friday, 7:00. US retail sales: Friday, 13:30. UoM Consumer Sentiment: Friday, 15:00.